After more than a year of planning and preparation, I’m excited to announce the upcoming launch of Reno Historical, a free smart phone app and accompanying website about Reno’s history that we’ll be introducing to the public on May 9th, the date of the town’s initial land auction in 1868. We’ll be holding a fun event downtown for the launch–more on that soon. This collaborative digital history project came out of my longstanding frustration that Reno’s history is almost completely unmarked on the landscape, even though glimpses of its rich heritage are visible everywhere. Sure, there are a few plaques scattered here and there, but in general, it is possible to walk from one end of downtown Reno to another without gaining any coherent understanding of its past. Reno Historical will be available as a website and free smart phone app. It’s hard to blame them for getting it wrong. Reno has in many respects erased its own history. That happened literally from the 1970s through the 1990s with the construction of multiple massive casinos, which, along with their accompanying hotels and parking garages, took out entire blocks of the city’s architectural and commercial heritage—as suddenly and as irreversibly as any urban renewal project could have done. But equally contributing has been a tendency to focus on the future without recognizing the incredible asset that our city’s unique heritage can be. Despite substantial changes, especially to its downtown core, Reno retains an incredible amount of historical integrity. When I lead occasional downtown walking tours, I always encourage my audience to stop and look up. The city is filled with early twentieth- and even late nineteenth-century buildings featuring gorgeous ornamental details, often hovering just above and behind their modern facades. Each building contains multiple stories that can enrich our appreciation of this place, deepening its meaning and strengthening our connection to it. Reminders of places that no longer exist can also connect us to our shared past. 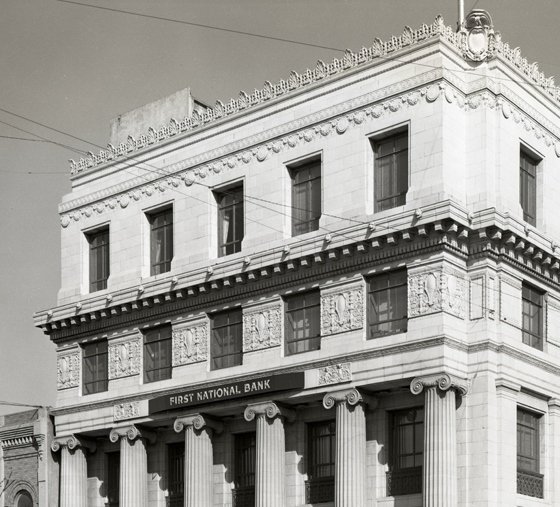 The gorgeous building on the northeast corner of 2nd and Virginia was once the Reno National Bank. Currently part of Harrah’s, the building houses an Ichiban restaurant. Photo courtesy of Special Collections, UNR Libraries. More than a year ago, I gathered together representatives from all corners of Reno’s historical community to discuss pooling our resources to launch a digital platform that could present accurate and engaging stories about Reno’s past to the public. Headed by Donnie Curtis, the Special Collections department at the University of Nevada, Reno Libraries offered to serve as the administrative hub. Startup funding was secured from the Historic Reno Preservation Society and grants from Nevada Humanities and the Institute of Museum and Library Services. The Nevada Historical Society, the City of Reno’s Historical Resources Commission, UNR Special Collections and numerous private collectors have graciously donated the use of materials, and the Regional Transportation Commission of Washoe County and the University of Nevada, Reno have funded the production of substantial historical content. Writers have included professional historians, community members, and students, for a truly collaborative project. We chose Curatescape, a digital, map-based platform with a simple layout, flexibility to function as both an app and a website (to reach the broadest number of people), and the ability to offer text, photos, audio, and video clips to present a wide range of stories about the city. We’ll launch with a good number of stories and then continue to add to it, expanding its offerings as we go. Reno Historical will be equally useful to people who are walking around town, eager to learn more about what’s around them, and to people who may never set foot in the city but hunger for accurate information about it. It’s time to capitalize on Reno’s amazing past as we continue to revitalize and celebrate our beautiful city! Stay tuned for more information about the launch and follow us on Twitter at @renohistorical.